CHICKEN SOUP FOR A COLD!!! Who doesnt love a cuppa soup for comfort? Nowadays with such a variety of ready made and available soup mixes, instant soups we have forgotten what a real home made hearty soup tastes like. In Spain there is still the culture of making a “caldo” (stock) in many families. Stock is the boiling of either chicken, meat or fish bones with some vegetables for a long time. The liquid (stock) is then strained and used as a soup or for cooking rice or for enriching ones food. My son simply loves a home made soup, specially in winter. 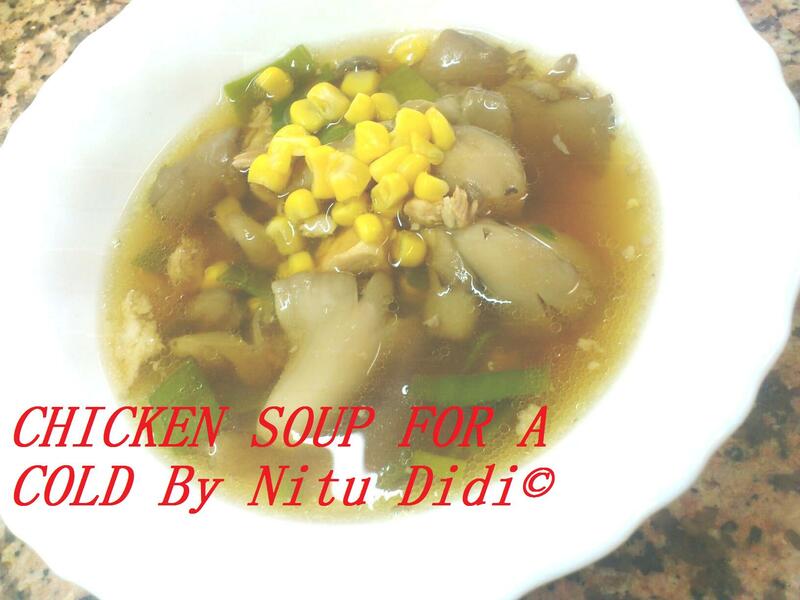 He visited me a while ago and complained of a slight sore throat and i quickly made this soup for him which he told me was amazing, soothing and very comforting. Miraculously his sore throat disappeared! Was it a mothers tender love and care or a soup with that “special medicinal” ingredient??? Why dont you all try it out and let me know? I added sweet corn and fresh oyster mushrooms to the soup , but you can add any sort of vegetable you like and fancy taking into account not to over cook them in the stock or else they will lose their nutritional value. I usually buy a whole chicken and have the butchers make fillets out of the chicken breast, chop the legs and thighs and seperate the carcass for soup. So what i do is add the chicken carcass and also the breast bone to make my soup. This quantity made about 1.5 litres of soup, if you want to freeze the stock you can double the recipe. The more chicken bones you add the more flavorful the soup will be. Put the water to boil with the ginger and once it comes to a boil add the washed chicken bones. Let it come to a boil again and remove all the scum (the whitish frothy thing which floats to the top of the pan) with a small sieve or a spoon. Add the pepper corns and salt , the onion and celery and boil it till it reduces to half. Strain the stock and remove the chicken flesh from the bones. Put the stock to heat gently and add cooked chicken from the bones, the oyster mushrooms, the sweet corn and all the seasoning. Let it come to a boil and cook for five minutes. Check and correct seasoning and serve. If you want a thick soup you can thicken it with a mixture of cornstarch and a little water. If you want to drink just plain chicken stock omit the vegetables and season as you like. If you like a thai flavor you can add some lemon grass, fish sauce and also some chilli sauce to it. If you love curry , you can add some curry powder to the soup. To freeze the stock : Just let it cool to room temperature, put it into a good container , cover it a freeze it. Or you can put it into small containers as individual portions. The ginger and pepper corns help comfort a sore throat. Ginger is very good for the stomach and digestive system. My son actually felt much better after drinking two whole bowls of this soup. This soup is low in fat and calories and can be had as part of a diet too! It nourishes and fills you up. This entry was posted in Chicken, Fusion, Gluten Free, Healthy Options, Low Cost, Made in China, NO OIL RECIPES, Soups-hot and cold, Thai and tagged chicken, cold, cure a cold, healthy, lowcalorie, lowcost, soup. Bookmark the permalink. 2 Responses to CHICKEN SOUP FOR A COLD!!! Una buena sopa, si señora.